(1) CDM(Cold Dark Matter) and MOND seems to be complementary descriptions of the same dynamics and phenomenology. (2) MOND force law works at galactic scales. This can be understood as a “proof” or manifestation of Dark Matter existence at certain scales, but it also implies a novel dynamics and new physics. and experimentally. The alternative to this explanation would be a modification of gravity with similar behaviour. But that modification is not easy or trivial in the framework of field theory! (4) A Born-Infeld inspired gravity, with per degree of freedom seems to do the role of a MOND dark matter theory at low temperatures. (6) Infinite statistics provides a relationship between MOND phenomenology and effective BIT gravity. It (infinite statistics) also appears in the M-theory framework. (7) The need for infinite statistics is due to the fact that it could capture the microscopic quantum dynamics of gravity! That is, gravitons/gravitational degrees of freedom could secretly obey infinite statistics. Infinite statistics is both non-local and non polynomial (nonlinear) in the field variables. It could also shed light on the issue of the BH information paradox and the firewall problem. The quon algebra (q-deformed Heisenberg algebra) is some kind of interpolation between bosons and fermions. Infinite statistics is also named Cuntz algebra. (10) The hamiltonian for infinite statistics in non local and non polynomial in field operators. It means that fields associated with infinite statistics are not local (either they have infinite derivatives or they have subtle nonlocal dependence in spacetime). Moreover, the fields associated with infinite statistics are nonlocal in the sense that their observables do not commute at space-like separation and/or their observables are not point-like functionals of field variables. (11) Despite (9) and (10), TCP and the cluster decomposition theorem holds in infinite statistics. (12) Quantum Field Theories (QFT) based on infinite statistics are unitary. Nonlocal QFT is more a virtue than a problem for infinite statistics. (13) Global physics through the cosmological constant and local dynamics of gravity at are connected somehow due to Quantum Gravity. (14) Quantum fluctuations of spacetime implies that the spacetime fluctuation scales as the cubic root of distances. (15) Quantum fluctuations of spacetime are measurable and testable (VLTI, incoherent photons, neutrinology,…). 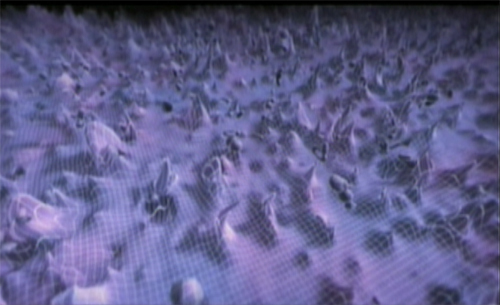 (16) The spacetime foam idea has consequences for Cosmology and Astrophysics. Indeed, it points out to Dark Matter and Dark Energy! (17) Holofoam/Holographic foam: dark energy is dynamical but it has very long wavelength, and this is why we can not detect it up to large scales. (18) Speculative idea: dark energy particles obey infinite statistics (an average case of the q-deformed Heisenberg algebra from the Bose-Fermi cases). (19) Dark matter/Dark energy transitions (the dark or hidden portal) could have radical consequences: decelerating-accelerating changes in the cosmic expansion. We need to study the dark portal and Dark Energy/Dark Matter “interactions”. (20) MONDian Dark Matter idea: combine MOND with MOG and CDM. (21) CDM-MOND crossover/transition should be better understood. That could be the key to quantum gravity. (22) Spacetime foam is related to the idea of turbulence and it has some ramifications related to the idea of quasicrystals as well. However, this effect is (yet!) too small to be detectable. Future telescopes like the VLTI could resolve this issue. In fact, Fermi+GRST rules out only! The holographic foam hypothesis “predicts” that . It gives a time shift . This last calculation shows that cumulative effects of spacetime fluctuations are important in order to consider coherence loss in photon propagation. (24) Divide L into parts of length with . How do the parts add up to for the distance L starting with ? Generally speaking, , with some constant. With and , we get . Thus, the cumulative effect or factor is proportional to the cubic root of the number of intervals, i.e., . (25) The random walk model for spacetime is ruled out by phenomenology but the holographic foam model is not ruled out yet. Stay tuned!